Last week, German consumer confidence came in at the highest level since January 2007. Confidence among German consumers bottomed shortly after the outbreak of the financial crisis in 2008 and has been going up ever since. Not so in France. In contrast to Germany, French consumer confidence has been stuck for years. Confidence among the French did also bottom in 2008, but, besides a few false up ticks, never managed to recover anywhere near the levels of 2007. 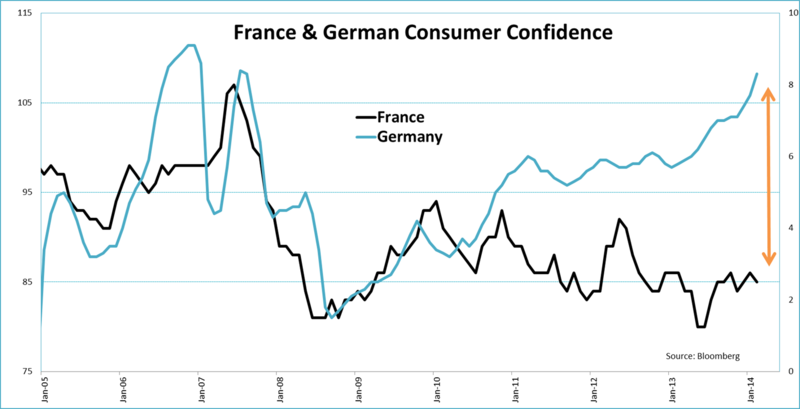 But what is behind this discrepancy between German and French consumer confidence? Well, there is one factor that stands out as explanation, unemployment. 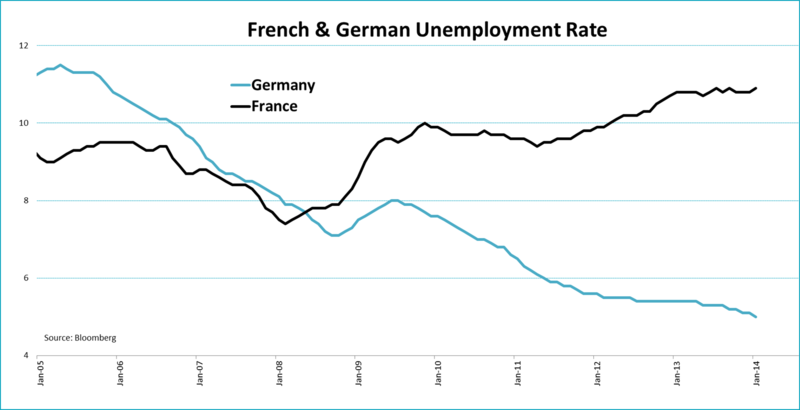 France and Germany have experienced quite a different evolution in their unemployment levels. Since 2008, the unemployment rate in France has risen by more than 3 percentage points. That is a massive increase and it reveals that while the immediate effects of the financial crisis have long abated, its long term implications remain clearly visible. Reasons for this increase in unemployment can be found in the lack of competiveness of the French business sector, as a result of strong wage growth, and the weak export mix. From this point of view France is not so different from the peripheral countries, where the rise in unemployment was even more pronounced. This is quite different from Germany where wage increases have been muted for at least a decade. This has made German companies very competitive internationally. Next to that Germany is an export power house. These two combined enabled Germany to profit massively from the recovery in global growth. As a result the German unemployment rate has almost halved over the last decade. Since 2008 the unemployment rate has come down roughly 2%. Hence, during the last five years the difference between unemployment levels between France and Germany has risen from practically zero in 2008 to almost 6% now. No wonder that the French are having trouble getting their confidence up. That’s not all. There is a second factor that is likely to have influenced the development of consumer confidence. German house prices have, finally, started to rise. After years of stagnant prices, the average value of homes has increased by more than 10% in recent years. 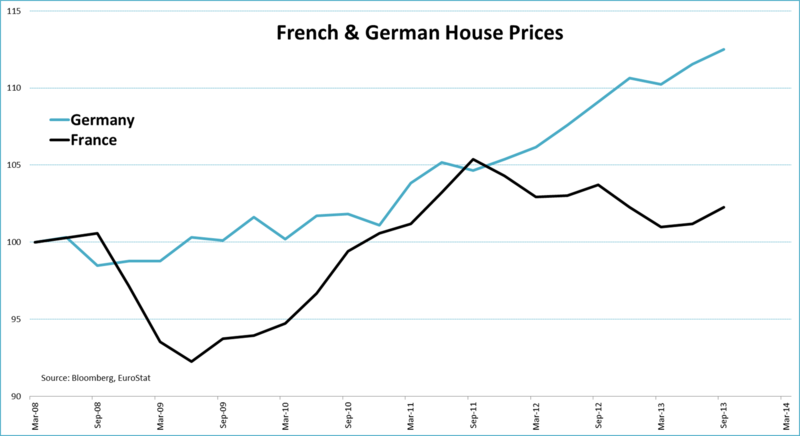 In France, however, house prices have not gone up that much. Since 2008 average homes have risen by an average 2%. That is well below average and definitely not something to get really enthusiastic about. Let’s take a look at household consumption in these two countries as well. Historically, consumer confidence has been loosely related to consumer spending at most. This is partly because consumers have fixed expenses like housing and so on that make spending less elastic. However, as the graph below shows, the substantial gap between the confidence level of French and German consumers that opened up after the financial crisis, was accompanied by a substantial difference in household consumption as well. 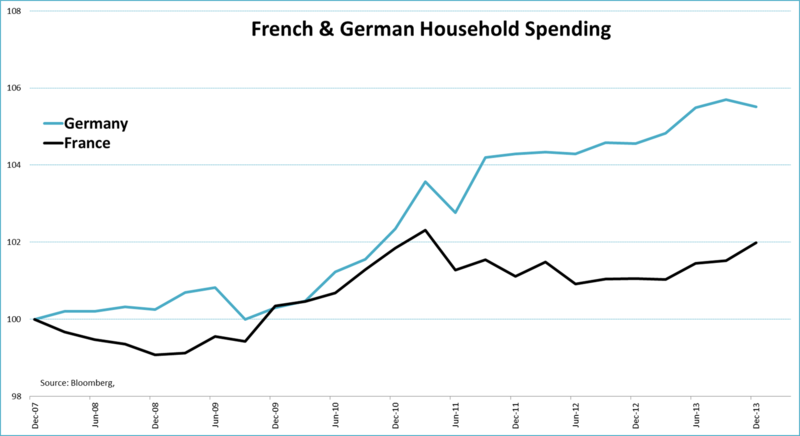 Taken from real GDP data, German household spending has increased by more than 5%, while French consumer spending has only gone up 2%. In recent years, the difference in French and German consumer confidence levels can be largely explained by both diverging unemployment rates and diverging house prices. In both cases developments have favored the Germans, which are reflected in stronger German spending numbers since the financial crisis.